The motion picture industry employed rudimentary sets since the beginning of film, but the term Art Director was first used in 1914 by Wilfred Buckland, an early pioneer of the craft and a member of the Art Directors Guild Hall of Fame. 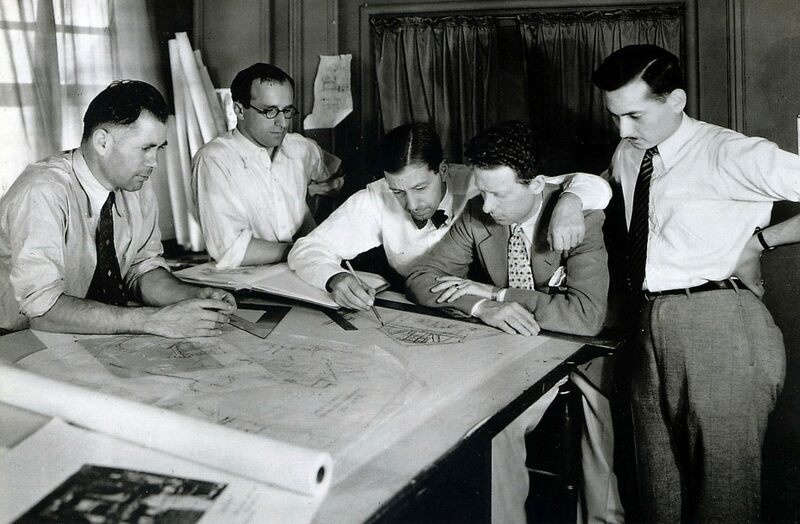 In addition to their artistic functions, most of these men (and they were invariably men) performed the duties now done by construction coordinators, location managers, and production managers. These early Art Directors, like similar groups of artists as far back as the Middle Ages, sought to band together to maintain professional standards and to improve their financial and creative status. The earliest such group in the motion picture industry was founded in 1924 as the Cinemagundi Club, with Leo “K” Kuter (Key Largo) as its founding president. The name was derived from the Salmagundi Club, a sketching society formed in New York City in 1871, which had recently purchased a brownstone clubhouse on lower Fifth Avenue. Kuter and the Cinemagundi Board bought their own clubhouse, and held regular meetings, hosted life-drawing workshops, and drank a lot. It was, at its heart, a social club for Art Directors, and it continued until 1937. The clubhouse, a residence on lower Beechwood Drive, still stands. 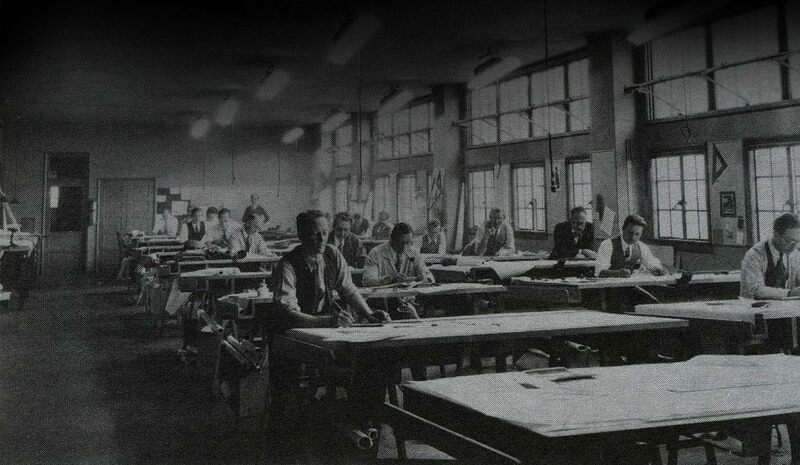 In 1929, the Art Directors League was formed, as a true craft guild, to improve wages and working conditions for Art Directors. 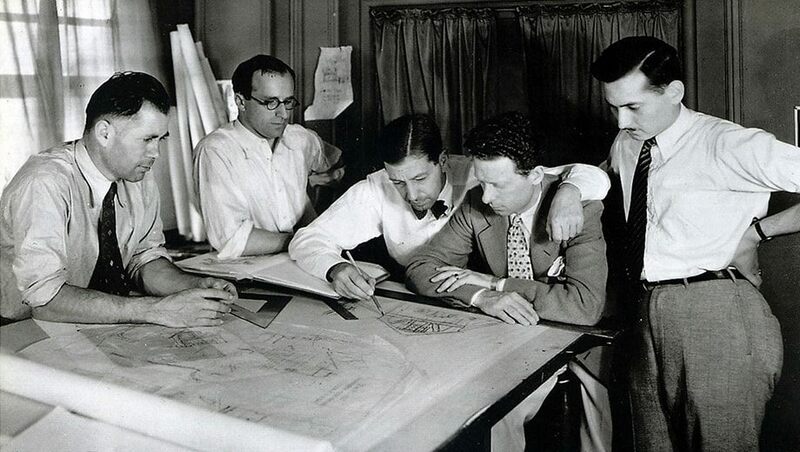 The Depression undercut the League almost as soon as it was formed and Art Directors, happy to have any kind of steady work in those difficult times, abandoned all thought of collective action. As the techniques of storytelling in motion pictures gradually advanced from the early 1900s into the 1920s, becoming more realistic in setting and action, filmmakers soon discovered the necessity of employing Illustrators to develop conceptual sketches and storyboards during preproduction and Matte Artists to expand the filmed visuals in production and post production. The Illustrators and Matte Artists soon were bringing life to the written words of the writer, the aesthetic visions of the Art Director/Production Designer and the ideals and actions planned by the producer and director. Exactly when the first conceptual illustrations and storyboards were created for a film has not survived the passage of time, but concept illustrations planning the first known matte shots by Norman Dawn in 1905 survive. He later executed matte paintings for his film, California Missions, released in 1907, showing how the then deteriorating structures initially looked in all their previous glories. By the 1920s, William Cameron Menzies was doing conceptual illustrations and storyboards and designing mattes for Douglas Fairbanks’ adventure films like Robin Hood (1922) and The Thief of Bagdad (1924). As an Art Director, he passed on his motion picture techniques to the future Illustrators and Matte Artists he employed. He would later become the first person to receive the screen credit, “Production Designer,” in 1939 for Gone with the Wind. For this landmark film on the American South during the Civil War, Menzies also chose to feature the illustrations of Dorothea Holt Redmond and J. McMillan Johnson and matte paintings of Jack Cosgrove, Byron Crabbe, Fitch Fulton, Jack Shaw and Albert Simpson to help realize the production’s now classic imagery. Following Menzies’ visions, the additional following indelible images have benefited from the conceptualizations, storyboards and paintings of the Illustrators and Matte Artists: King Kong’s prehistoric world; the Wizard of Oz’s Emerald City; the bell towers, gargoyles and flying buttresses of the Hunchback’s Notre Dame cathedral; the castles of the Three Musketeers; the Pirate strongholds of the Caribbean, the Seahawk and Treasure Island; the Roman empires of Caesar and Ben Hur; Citizen Kane’s fabled Xanadu estate; Tarzan’s African tree house; Cleopatra’s Egypt; the King of Kings’ Jerusalem; the last stands of Custer, the Alamo and the Spartan 300; the sinking of the Titanic and the Poseidon; the private lives of Elizabeth and Essex, Porgy and Bess, Funny Girl and Benjamin Button; the night life conquests of the Terminator, James Bond and Batman; the daylight conquests of Superman, Iron Man and the X-Men; the futures of Blade Runner and H.G. Welles; and the universes of Flash Gordon, Star Trek and Star Wars. And, of course, there have been many, many more that have also come to life thanks to the initial strokes of the Illustrators and the final touches of the Matte Artists. As the early 20th century methods of film making evolved into a major industry, the various trades they employed were subsequently organized into guilds and unions. By the 1930s, the Illustrators and Matte Artists were part of the Federation of Motion Picture Crafts. By 1941 they became a part of the Conference of Studio Unions. In 1945, they received their own chartered local, Local 790 in the International Alliance of Theatrical Stage Employees, which by the 1950s became the dominant labor organization representing the motion picture and television job categories working behind the camera. 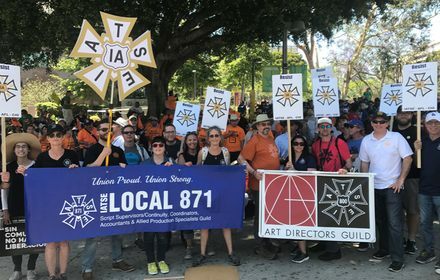 In 2008, the IATSE merged the Illustrators and Matte Artists’ Local 790 into Local 800, the Art Directors Guild, which is now comprised of most of the major cinematic art crafts in Hollywood. 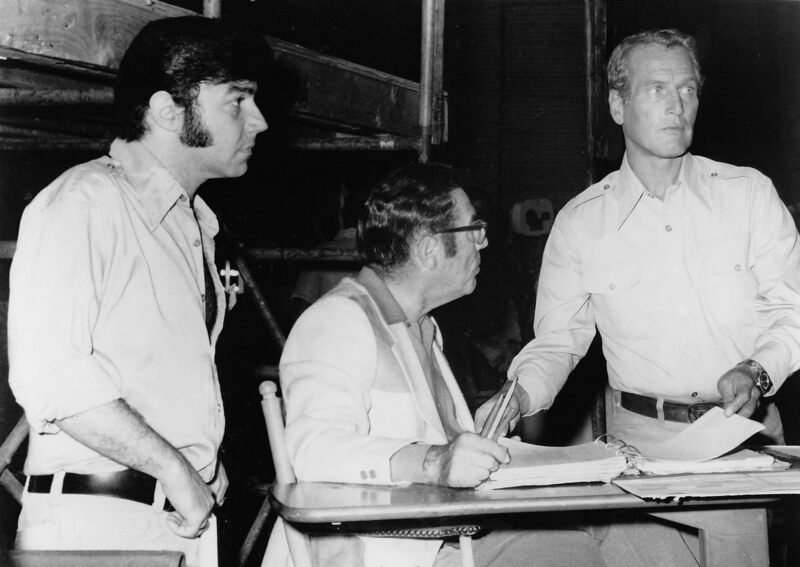 Towering Inferno, Joseph Musso, Irwin Allen, Paul Newman. In the early days of the Local #847, there were several levels of experience a person would work through to become a Senior Set Designer. Similar to an apprentice program, and beginning with the category of Junior C, 3,000 hours of work experience would be required to ‘move-up’ to Junior B. An additional 3,000 hours were required to move to the next level, Junior A. Even the Senior Set Designers had multiple categories: Senior I and Senior II. All of the Senior I members had to be working before someone could move-up from Senior II to Senior I. The following contribution is by Jim Wallis, Local 847 member, originally included in the SDMM Directory, 2002. “Welcome to the first Set Designers and Model Makers Directory of the new millennium!” With the turning of the millennium, our Local is a little more than a year from turning 50. I could not think of a more opportune time to ponder where we’ve come from and where we are going. As I looked over the artwork so graciously made available by 20th Century Fox, and read “The Olde Days” by Roland Hill, Jr., it really hit home how much the manner of what we do has changed and yet the artistry has remained the same. We still design “houses and hovels, skyscrapers and shacks, trains, planes and automobiles, sea ships, spaceships and prairie schooners”, to quote my predecessor — we just do it in a variety of old and new ways. I find that I am frightened by the possibility that we are losing some of our heritage and our knowledge. In “The Olde Days” there were large art departments in which people worked their way up. This was an incredible system for passing on knowledge, all the new kids on the block were able to learn from the experience of the old hands, and there was always someone to turn to with more experience than you had. Alas, all of that system has vanished, but the knowledge has not, at least not yet. One of the greatest things we can do as a Union is to educate our members. Educate them with the experience of all those who have gone before us as well as to educate them in all the new technologies that are rapidly taking over our entire industry. There are two things that we are doing about this. First, with the help of Contract Services, our members are teaching each other. We are continuing the great tradition of passing on knowledge from Seniors to Juniors. Many of our members have devoted a tremendous amount of time and energy into this amazing endeavor, all that I can say is that everyone should take advantage of it. God forbid!! You might learn something. Second, again with the help of Contract Services, classes in the computer technologies are being offered. We have to stay abreast of all these new methods of performing our work if we want to be competitive in the ever-changing industry. We need to be able to communicate with Special Effects and Post Production who have leaped into the electronic age, and if there is going to be virtual scenery it would be much better that it be created by Set Designers using computers, rather than computer technicians attempting to design. 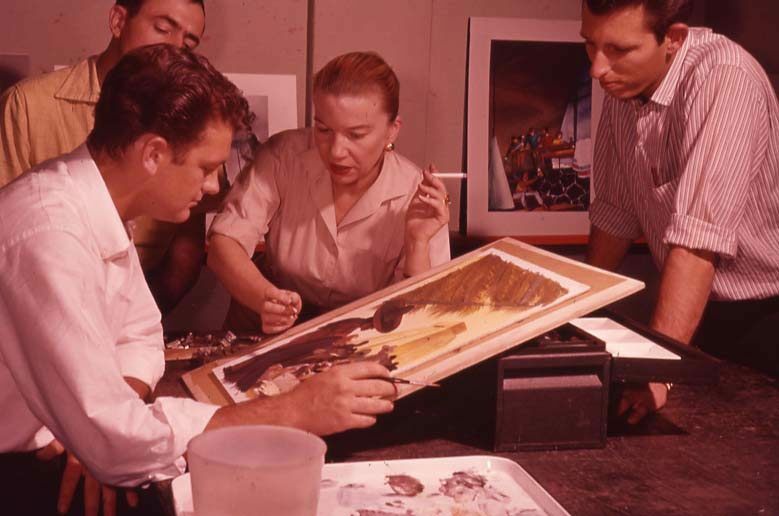 The creation of its own local (formerly known as Local 816) in March of 1949 marked the first time the Hollywood Scenic Artists and Title Artists had its own local representing its unique needs. Previously, the members were part of Local 644 of the Conference of Studio Unions (CSU) working in film and theater. The overwhelming majority of Local 644's membership, however, had been made up of set painters and paperhangers and included set designers as well. It was not until the dissolution of the CSU after a long series of bitterly contested strikes that the scenic artists were able to organize exclusively. Those artists had been pioneers in their field, responsible for devising and developing the methods used to create representational scenery unsurpassed anywhere in the world. 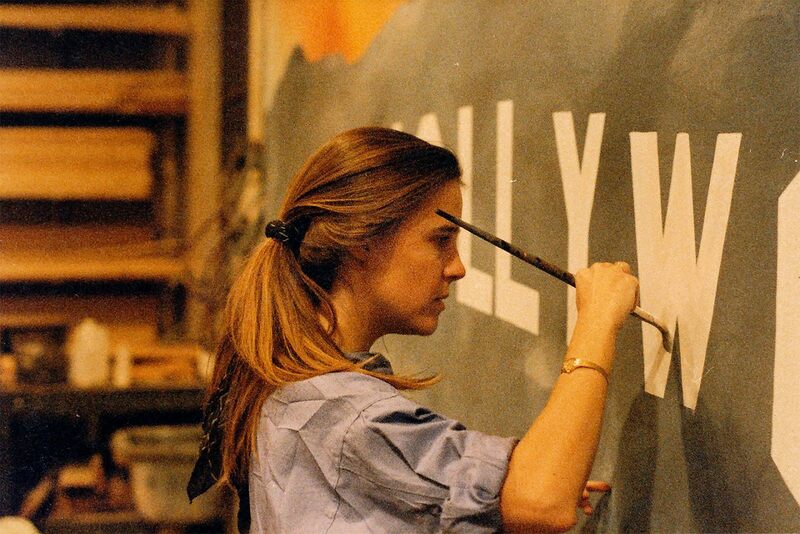 Leslie Diller Zollo, Scenic Artist, at work, 1986. The size and strength of the local grew with the inclusion of television contracts in the early 1950s. Television, at that time, was in effect an extension of live theater and required a lot of painted two-dimensional scenery instead of the three-dimensional sets used in film. As the nature of television scenery changed, the responsibilities of the television scenic artist broadened to include those of the set painter. Local 816 was the only local in the entertainment industry that worked in all three major areas of the business: film, television and theater. January, 2003, the 850 members of ADG merged with the 650 member Scenic, Title and Graphic Artists to form the Art Directors Guild & Scenic, Title and Graphic Artists. 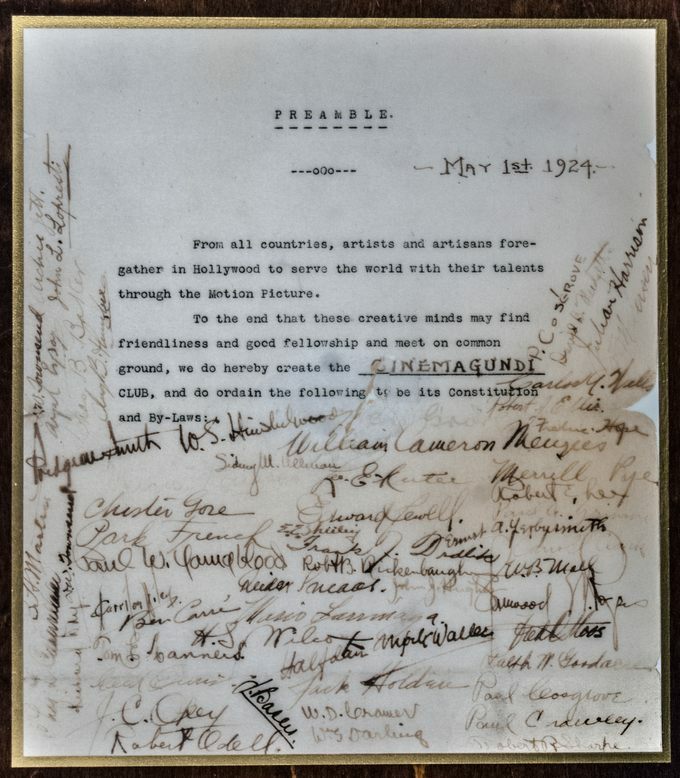 Named after the Salmagundi Club, New York City’s club for artists, the Cinemagundi Club was a social club formed in 1924 by a group of Hollywood Art Directors including William Cameron Menzies and Anton Grot. 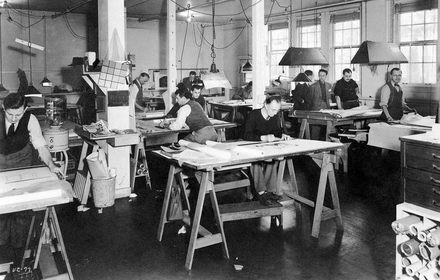 The Art Department drafting room at Warner Bros. in early 1930s.